Thank you Quarto for sending products for my gift guide. All opinions are my own. I have a crafty streak myself, so I love that I now have a couple of nieces who are a bit artsy. I enjoy picking out unique arts or crafts related gifts for them. This year, I turned to Quarto for my creative people gifts! 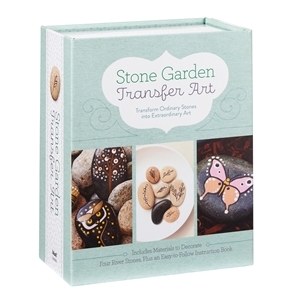 Stone Garden Transfer Art is a kit designed to assist you with turning ordinary rocks into pieces of art. This kit is for all ages or experience levels. The kit includes 8 rub-on transfers, 4 small river stones, 2 paint brushes, a foam brush, an acrylic set of 6 paints in various colors, a clear coat to seal your work, and a 48-page instruction booklet. With this kit you can transfer art or paint rocks, or both! In my area a lot of people participate in painting rocks and hiding them in public places for others to find. This kit would be the perfect gift for anyone who has enjoyed that, or for anyone who is up for learning a new way to explore art. 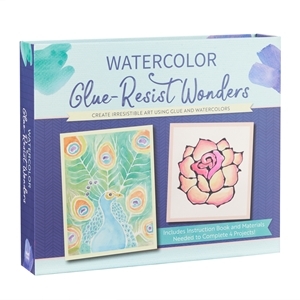 Watercolor Glue Resist Wonders is another fun crafty kit. I doubt many people have tried their hand at this specific craft. I plan to give it to my niece who has a lot of experience with a variety of crafts. I’m hoping this is one she hasn’t tried before so it will be a new experience for her. The kit includes pre-printed template paper with artistic designs on it. You use the glue included to outline the designs. Then after the glue has dried, you use the watercolors (included) to paint over the piece. The paint will not adhere to the areas where there are glue, creating unique works of art! 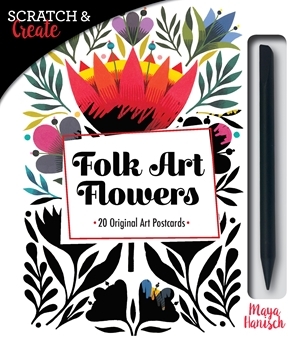 This Folk Art Flowers is a scratch art kit with 20 art postcards. It comes with a little tool with a pointy end and a more blunt end. You use it to rub off the top black layer to reveal the pretty colors underneath. I kept this for myself and it took me a while to get a hang of how to do it. I thought I should scratch from the side, similar to how you would scratch off a lottery ticket. I found that if I use the utensil from a side-angle, it scratches off the black layer AND the colored layer, leaving the page damaged. The trick is to press down and slide gently instead of scratching. I like how these can be fun to do as a craft, but then they are also postcards so you can use them to send a sweet message to a loved one. Quarto has a wide range of books and craft kits. They truly have something for everyone so be sure to check them out. I love Quatro, books, calendars, crafts are just awesome. My daughter has been artsy since she was a young child and is now a real artist. I would enjoy the Folk Art Flowers scratch art kit. These would be fun to make.